And we can think of the “model” category as being composed of the same three categories. If we stop here we have a perhaps overly simplistic outline of the kinds of things to be learned in computing (and many other activities as well). How many ideas are there here, and especially, how many ideas at a time can learners handle? How much real practice of each of these is required for real understanding and operational usage? Where can we look for useful parallels that will help us think about our own relatively undeveloped area? To take the last first, we would (or I would) be very surprised to be able to prepare someone as a professional in 4 years of college if they started from scratch in any of the possible parallels listed above. To go to the really simplistic idea of “hours put in”, there just aren’t enough actual hours available per year (3 practice hours a day is about 1000 hours a year) and professional fluency in any of the above will require more than 4000 hours of practice from most learners. And it’s not just a question of hours. There are longitudinal requirements (time for certain ideas and skills to “sink in”) which probably represent real latencies in both the “notional” and physiological parts of learner’s minds. A large number of those going into any of the four areas started learning, training, and practicing in childhood. And for those who try to start as a first year college student …. a. This “problem” is “solved” for music partly by the existence of “pop music” much of which does not require deep fluency in music for participation. (And it is certainly not hard to see real parallels and the existence of “pop computing” in our culture.) Classical and jazz music simply require a lot more time and work. b. The problem is solved for professional sports by excluding the not skilled enough (and even quite a few of those with skills, and who did start in childhood). The last census listed about 65,000 professional athletes in all US sports. This is a small job market. c. The problem is solved for the hard sciences (and medicine) most often with extensive postgraduate learning, training and practicing (and by high thresholds at the end). Should we ask where those who, for one reason or another didn’t make the cut, wind up? d. I don’t know what the engineering demographics are (but would like to). Engineering has always had a strong ad hoc nature (which is what allowed it to be invented and practiced long before mathematics and science were fully invented). Architecture is harder than bricklaying, so one could imagine many with engineering UG degrees winding up in technical companies in what would be essentially apprentice processes. I’m guessing that this is where similar computer students with undergraduate degrees might wind up — essentially doing bricklaying in some corporate notion of architecture. Both of these last two seem to me to be dead ends — but it would be good to have more than personal and anecdotal evidence. My own observations would generalize to “they don’t learn much that is good” in their undergraduate experience, and “they learn even less that is good when on the job”. I think universities have a moral obligation to try to deal with the “they don’t learn much that is good” part of this problem. And doing this well enough could cause large useful and important changes in industry over the next decade or two. If I were going to get started on this, I would try to put forth a very clear outline of the six aspects of computing I listed above, show how they work together — and try to sketch out what it actually takes to learn them for most college students. In my thinking about this I keep on coming back — not to the problems of “coverage” over 4 years — but what seems to me to be the larger problem of getting in enough real practicing of the various kinds needed to actually ground the ideas into thoughtful and operational tools. In response to my piece on Millenials, Raymond Lister pointed out that his ITICSE working group report was about reading code while the work by Jim Spohrer and Elliot Soloway was on writing code. Of course, he’s right. But his passing comment had had me thinking all night. How different are those tasks? I worked with Elliot for (mumble, mumble) years, and I read all that I could by him and Jim. I just leafed through Jim’s dissertation again this morning (yeah, it sits on my shelf — I really am a total geek! But now it’s on Google Books, too!). I feel like there is such a similarity between what Lister’s group was working on and what Spohrer was working on, but I can’t quite put my finger on what’s so similar. Let me quote a bit from Raymond et al.’s paper, if he doesn’t mind. (If he does, I’ll delete these later.) This is Question 5 of the multiple choice question (MCQ) instrument that Raymond’s group created and presented to students. It was the easiest question, in terms of how students actually performed on it. First off, I don’t find this question particularly easy. It involves careful tracing, but I do agree that it feels like something that students should be able to do at the end of the first semester of Computer Science. Why is that? Why does it look like something we expect students should be able to do? Elliot’s group at Yale explored a model for how programers write programs that focused on goals and plans. Goals were what you wanted to do, and plans were how you did them. Sometimes you set a goal, and tried to implement a plan, but failed (reached an impasse). So you tried a different plan. Plans were models of code, typical pieces of code that you wrote or saw a million times. Rob Rist had a similar theory, structured around schemas instead of plans. Tom-a-to, Tom-ah-to — it feels similar to me. Say I showed this to you and said, “It’s not working — what did I do wrong?” I’m guessing that every reader of this blog would immediately say, “You forgot to increment i inside the loop!” How did you know that? Because you traced the code? 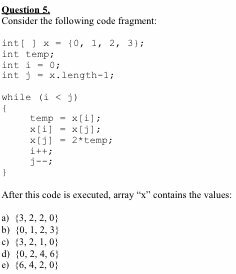 I suggest that you all know the index-across-the-array-with-a-while plan, and know that a common problem is forgetting to increment the index inside the loop. You didn’t have to trace this code as much as you saw the problem, because you know this plan. Why does Question 5 look so reasonable to us? Because it looks like reversing an array? Because it looks like the code for swapping elements of an array? Both of those might be true. In general, it looks like code we’ve seen many times. We feel like we recognize those plans. Here’s Question 8, the question that students performed the worst on. This one feels harder to me. Why? The code looks like the code for a sort, like a Bubble Sort, but it’s not really. It triggers my plan-recognizer enough to say, “Sure, I should be able to do that.” But when I try to match my plans to this, it doesn’t quite work. So I have to do step-by-step reasoning, what Cognitive Scientists call weak methods. If I immediately recognize a problem and can provide a ready-made answer, that answer is often right — that’s a strong method. If I can’t do that, I fall back on my backup approaches, like tracing code line-by-line, which is more often going to fail. Did students recognize that they had to trace to solve this problem, or did they just plug in what looked the most like Bubble Sort to them? And once they recognized that they had to use a weak method, did they apply that method correctly or did they make a mistake? On a side note, this question feels a bit like cheating on the “it’s about tracing, not writing code” claim. Isn’t picking which expression or statement fits very much like composing the right plan into the code? At what point does identifying code cross from a “tracing” task into a “writing” task? Is it “tracing” because I didn’t have to type the characters in or fight the syntax? In the end, I think that these two explorations, 12 years apart, feel similar to me because I can use the theory from the first one to explain the second one. That is something that I don’t think we do enough of in computing education research today: Make theory, use theory to generate predictions, then test those predictions. Many of the ICER conference papers present descriptions and analyses. Those are great and important. Many of the conclusions of ICER papers make recommendations for how we teach. That, too, is great and important. But science is about making theory, and progress in society comes from using scientific theories to make useful predictions. We need to get to the point where we can be predictive in computing education research. Really exciting piece by Jason Freeman, Georgia Tech music professor, in the New York Times yesterday. I think what he says goes just as well for software — so many of us use it, so few of us express ourselves with it. These days, almost all of us consume music but few of us create it. According to a recent National Endowment for the Arts survey, only 12.6 percent of American adults play a musical instrument even once per year. The survey does not report how many of us compose music, but I suspect that percentage is even smaller. It saddens me that so few of us make music. I believe that all of us are musically creative and have something interesting to say. I also wish that everyone could share in this experience that I find so fulfilling. via Compose Your Own – Opinionator Blog – NYTimes.com. This is a really interesting idea, especially for computing education. One of the challenges of teaching computing (and even doing computing, for that matter) is that we have not yet learned to make explicit all the knowledge that is necessary. We’re finding that in some of our studies of adult learners — they talk about the “secret” of programming, and that the teacher is “hiding something” from the students. An apprenticeship model would give students the opportunity to learn and develop those skills that we do note yet know how to explicitly teach. What if we prepared teachers the same way we prepare doctors?As school reformers lurch toward more innovative ways for training classroom teachers, this idea is getting a lot of attention. A handful of teacher “residency programs” based on the medical residency model already exist. Boston was one of the first to create one in 2003.
via Programs Train Teachers Using Medical School Model : NPR.